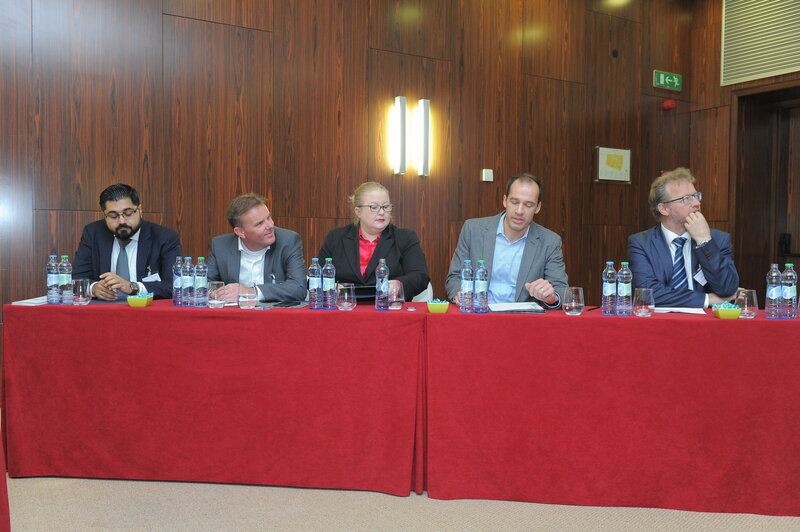 From left to right: Avinash Hotchandani (Robertsons / Hong Kong), Maarten Jansen (De Advocaten Van Van Riet / Netherlands), Nicola Mc Neely (Capital Law / UK) , and Bart van der Brande (Sirius legal / Belgium), Martin Hütte (Hütte Law / Switzerland). We had a very interesting panel discussion during the CONSULEGIS Business Meeting in Prague about : Blockchain, Smart Contracts and Cryptocurrencies and how it will interact with legal and financial systems.Five experts members of CONSULEGIS shared some of their knowledge and experiences on this like –Nicola McNeely (Capital Law) , Bart van der Brande (Sirius Legal), Martin Hütte(Hütte Law), Avinash Hotchandani (Robertsons Law Firm) and Maarten Jansen (De Advocaten van Van Riet).They discussed its impact in the legal world and provided several examples of how they work with it on a daily basis, all of this in a very dynamic, attractive and enjoyable way. Any of them are available to answer any question you may have in this growing topic. Actually, whithin our industrial group, we will put in place a Blockchain group. We will continue deepening this matter in upcoming seminars or conferences. Thank you all for delighting us with such an amazing roundtable! Click here to see their profiles and a very useful glossary of topic-related words. ABOUT CONSULEGIS: Grow together locally & internationally! CONSULEGIS, an international network of independent law firms and other advisory professionals, with members in more than 45 countries and 150 cities around the globe. The principal objective of Consulegis is to provide its members with the right resources for their clients throughout the world and to arm its members, whose clients have legal and business requirements extending beyond their borders, with the ability to refer clients to known and trusted colleagues in all corners of the commercial world.